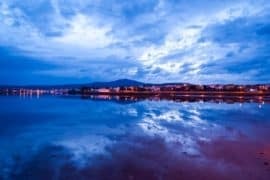 Palma, the capital of the Spanish island of Majorca, is a chic city that has developed into a must-visit destination for those seeking sun, sea, style and sights. A city that was once overlooked in favour of generic beach resorts further along the coast is now having a real moment of its own. 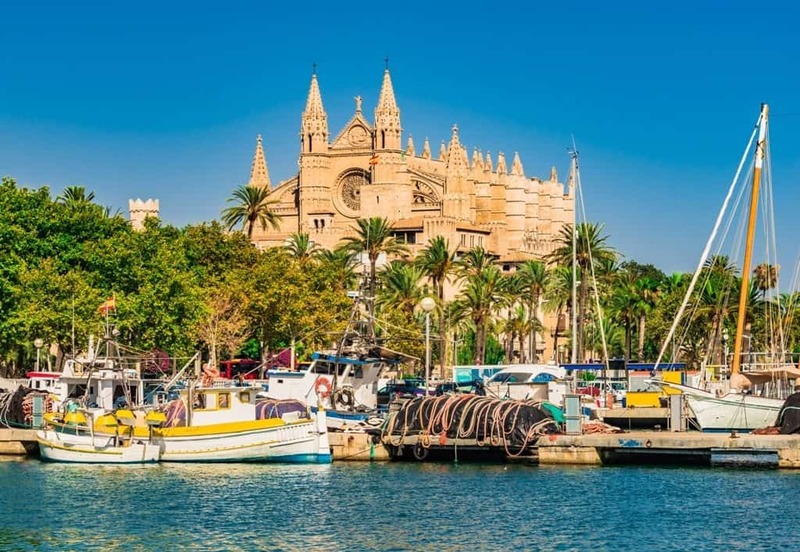 Everyone from foodie fanatics to history lovers will be enthralled by Palma’s character and culture. It really is the perfect place to spend long afternoons strolling in the sun and savouring Spanish flavours in pavement cafés. Palma’s architecture is truly striking so exploring buildings such as the Catedral-Basílica de Santa María, the Royal Palace of La Almudaina and the Castle of Bellver are a must. Not only do these stunning buildings offer great photo opportunities, but they also give travellers a real insight into the history of the island, from the Moors to modern day. Plus, the town and harbour are dotted with gently swaying palm trees and are usually doused with Spanish sunshine making any Spring/Summer visit simply spectacular! From Old Town charm and cool cafés, to modern museums and Michelin-starred dining, Palma really does have something for everyone. With stunning beaches and crystal clear water you have to go on a boat trip to enjoy the Mallorca to the fullest. There are many different kinds of boat tours – you can either book a tour in advance or just be spontaneous and book at one of the numerous boat stops. If you like it more adventurous book a speed boat trip, or, book a boat tour which shows you around the east coast and takes several hours. 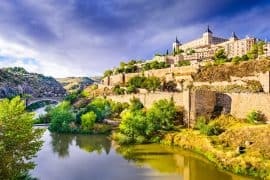 You will not only see the most beautiful places along the cruise (seriously, I could stare at those caves and water for hours) but normally, there are a couple of stops. 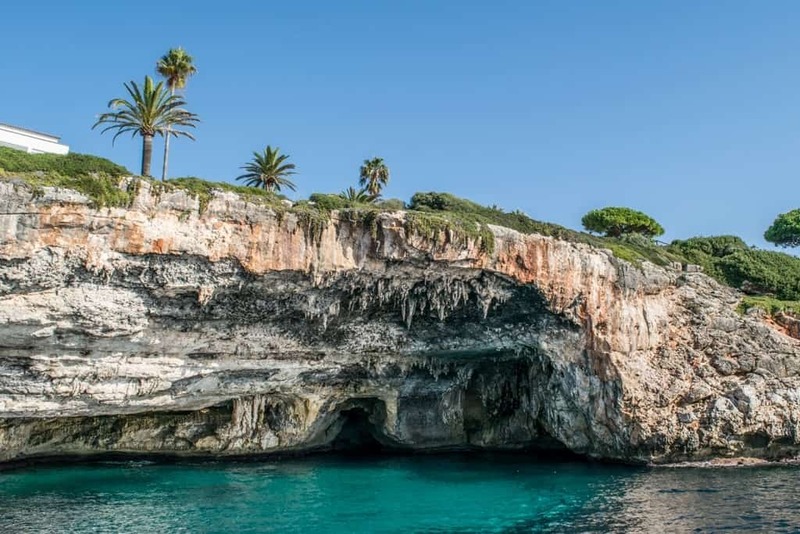 I started at Calas de Mallorca, our boat tour stopped at CalaMillorwhere I had a stopover of about 90 minutes. Calla Millor is a busier place on the island with a beautiful beach that had been on my list – so, a boat tour gives you the chance to explore other areas in a short time. Also, they do shortstops so you can hop into the water and enjoy the pristine water (so, definitely take your swimsuits with you). Boat cruises are quite affordable given Mallorca´s popularity and so are drinks and snacks on the boat. 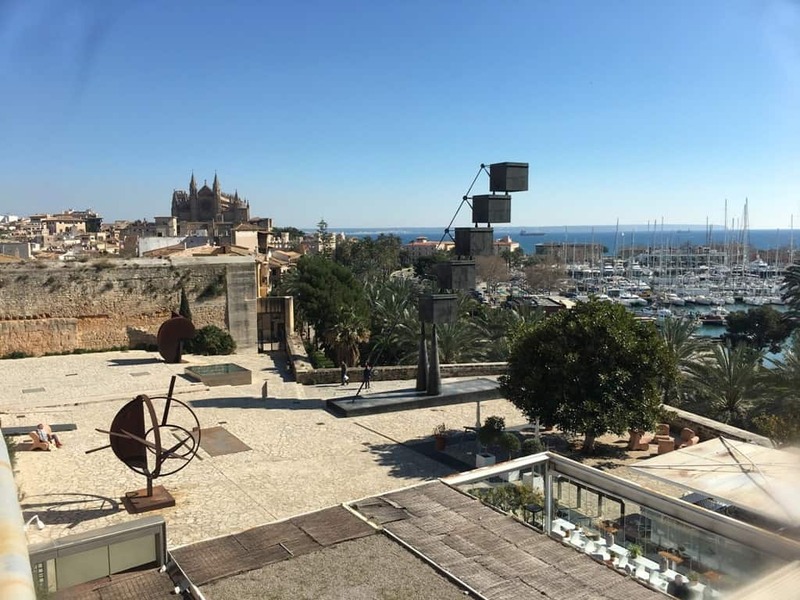 If you’re a fan of art and culture or even just interesting places for dinner then you really must visit the Es Baluard Contemporary Art Museum located in a centuries old military fortress in Palma’s old city walls. The Gallery is home to some stunning works of art with permanent pieces from famous artists such as Joan Miro and Picasso alongside constantly changing temporary exhibitions. Once you’ve made your way around the exhibits, climb the stairs to the roof of the museum where you can explore the old city walls and take in the fantastic views of the Catedral-Basílica de Santa María against the bright blue Mediterranean Sea. Another reason to visit Es Baluard is the gorgeous outdoor terrace restaurant, the perfect place to enjoy a glass of fruity white Rioja or order a plate of tapas surrounded by huge, contemporary sculptures. You don’t need to pay the entrance fee to visit the terrace restaurant so even if you don’t have time to explore the whole museum, for the price of a glass of wine you can get your fix of some contemporary art. Contributed by Fiona of London- Unattached. A network of over 70 historic shops in Palma which each have significance in the heritage of the island, the emblematic shops include traditional bakeries, shoe makers, wickerwork shops and handblown glass. To qualify as an emblematic shop each needs to satisfy at least one criteria listed by the local council. Either opened before 1943 or over 75 years old, showcasing the traditional trades of the Balearic Islands or housed in a heritage building. But, if you do decide to visit some of the shops yourself, you may well meet the third or fourth generation owners who now run the shops just as their grandparents and great grandparents did. 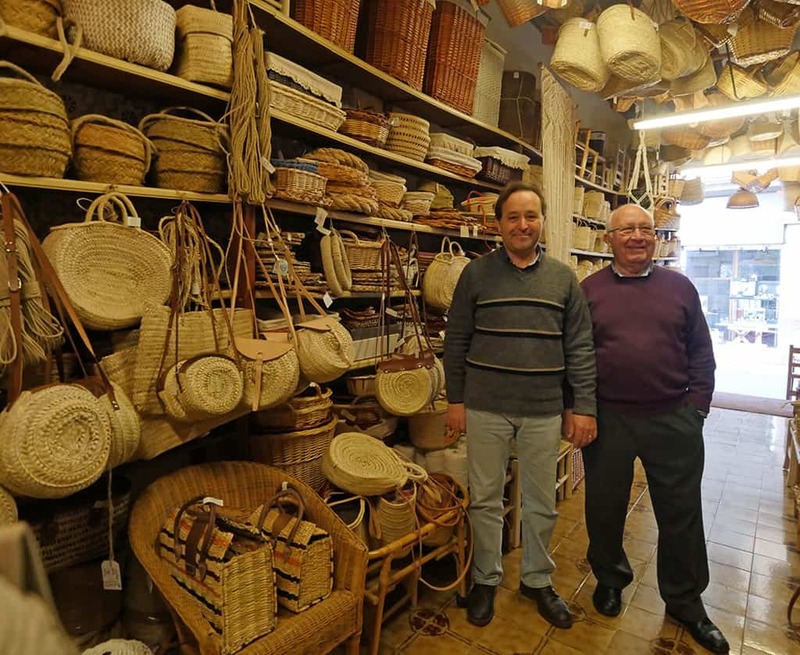 Buying a handmade traditional Mallorcan wicker basket from Mimbreria Vidal or traditional Ensaimadas from Forn Fondo is a far cry from a fridge magnet made in China – and you’ll be supporting local historic businesses. You’ll find a directory and more detail about the emblematic shops of Palma on London-Unattached. The magnificent Catedral Basilica de Santa Maria de Mallorca, “La Seu,” is one of the most amazing cathedrals in Europe. Its’ incredible size dwarfs many related cathedrals, and its grandeur on the shores of Mallorca provide for a beautiful backdrop against the island. The cathedral’s Gothic style architecture is considered among the most pronounced and the cathedral itself is also one of the highest in Europe. A visit to the cathedral is well worth it, with a small museum inside and an abundance of beauty inside. A rose window made of stained glass, is one of the largest in the world, and creates a beautiful array of multi-colored light inside. The huge arched entrance inside the cathedral is eye catching and is incredibly detailed, drawing tourists in to view the artisan work. Tombs of several kings also lay in the Royal Chapel for viewing and a Bell Tower, which holds 9 bells, is a point of interest in the cathedral. Fun Fact: Antoni Gaudi, the designer of the Sagrada Familia, was a part of the rebuilding efforts of the cathedral before a supposed argument with a contractor had him leave the project. The quiet town of Santa Maria is a short drive or train ride out of Palma. Even without a car, it’s very accessible from the central train station. It’s a nice break from the city and located in this small town is the Macia Batle winery. 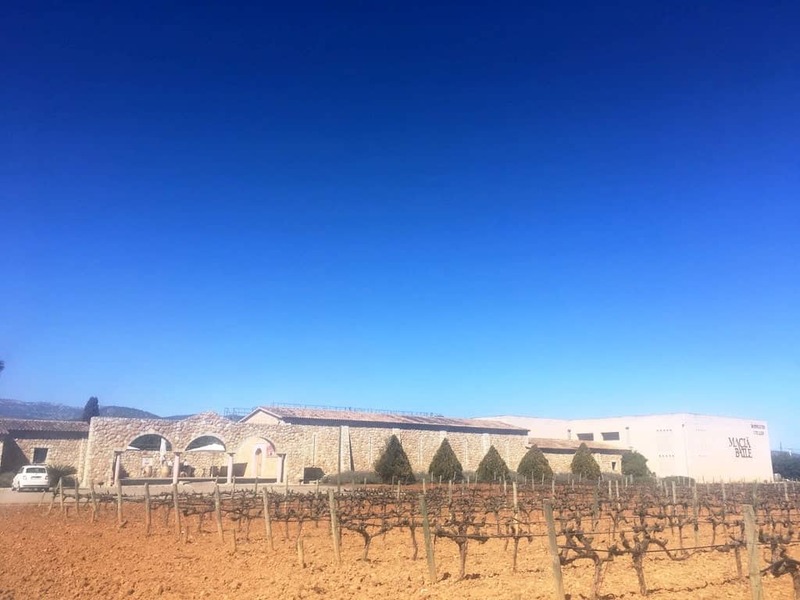 The winery moved to Santa Maria in the 1990s (though they’ve been making wine since 1856) and can you have the pleasure of visiting the winery and enjoying some wine and tapas in the sunshine. But, for a mere €11, you can take a tour and have a tasting of some of these fantastic wines. You’ll learn about the history of the winery and be taken through the factory to learn about how the wine is processed and created. At the end of the tour, you can try a selection of wine with some appetisers. It’s a great trip from Palma and well worth the price if you enjoy learning about drinking the local wine. Always book ahead for the tour. One of the best things to do in Palma is to take a day trip to Soller, a pretty town in the hills north of Palma. To get to Soller, you could hire a car, but far more fun and interesting is taking the historic Palma to Soller train. The quaint wooden train leaves from a station next to the main bus station in Palma on Plaça d’Espanya, making it an easy excursion from anywhere in and around Palma. 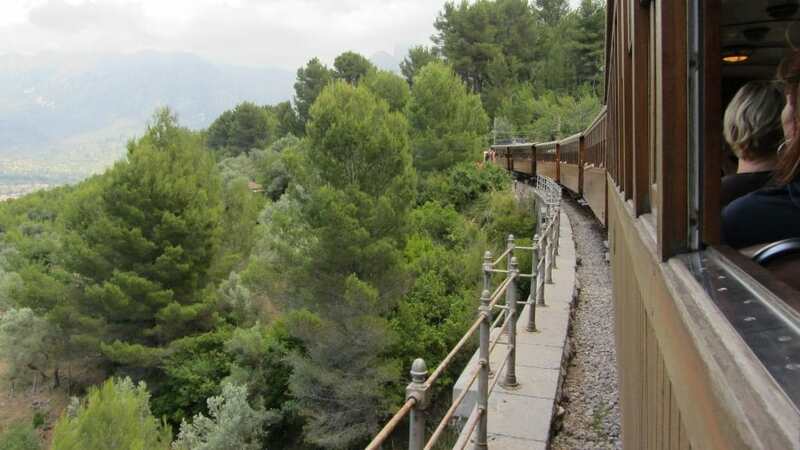 The line to Soller was opened in 1912 and is nearly 28 kilometres long. Over the course of the journey, which takes around an hour, you’ll get to see the Mallorcan countryside, which gets more rugged as the train climbs into the Tramuntana mountains. There are lots of tunnels and several stunning viaducts on the route; some trains stop at key points so you can take in the views. Once you’ve reached Soller, you can either enjoy a walk around the picturesque village centre, or you can take a vintage tram the short distance to nearby Port de Soller. The tram winds its way through the streets of Soller, then through orange groves to the beach at Port de Soller. One of my favourite things when on a trip is visiting an aquarium. The aquarium in Palma was one of the highlights on my holiday to Palma. It’s totally awesome and one for all the family. If you enjoy checking out an underwater world and discovering amazing fish, then the Palma aquarium should be top of your list. Palma is an amazing place to visit, however the aquarium was by far my favourite thing to do. We were lucky enough to visit this awesome aquarium on a quite day and got some of the best views watching the sharks without the hustle and bustle. What makes this aquarium so great? The palma aquarium is home to the deepest shark tank in Europe, it’s brilliant. Also, this epic aquarium has one awards in the past. 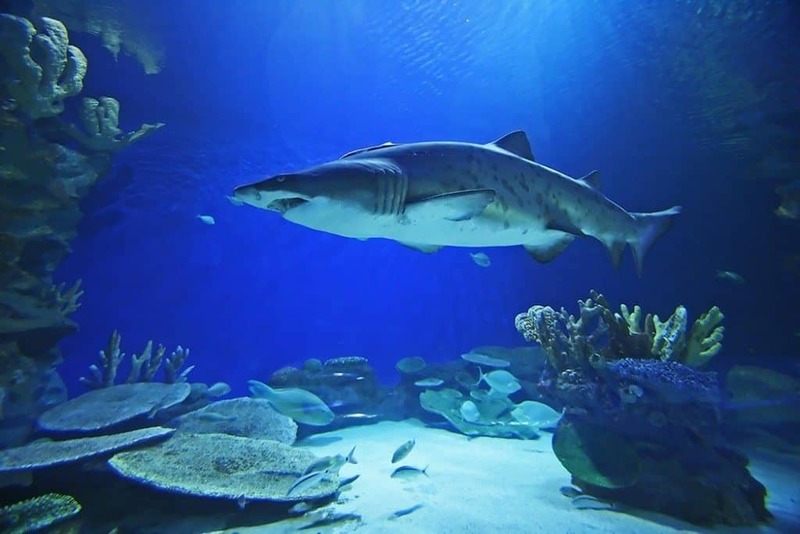 If you visit the aquarium you will be taken on a crazy journey through the some of the most amazing fish tanks and get to learn about the underwater world. 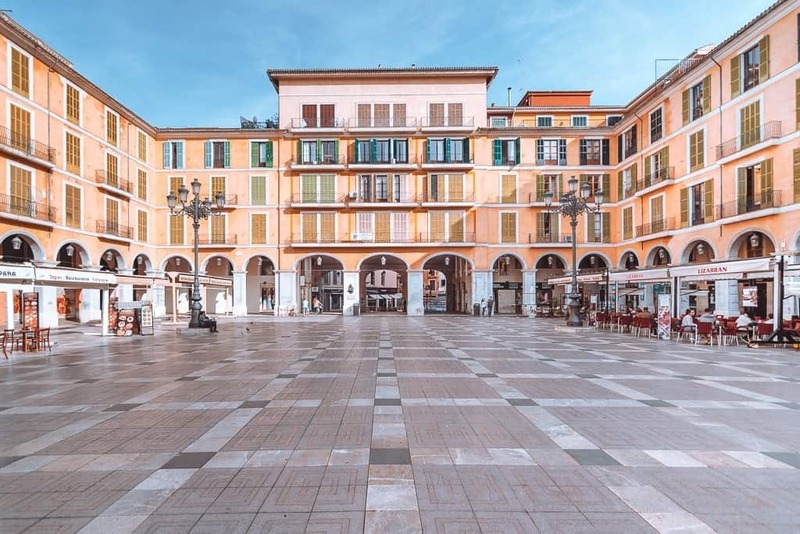 Plaza Mayor (Plaça Major) is the main square in Palma de Mallorca and here you will find several restaurants and bars where you can sit down and people Watch. It’s a popular spot during summer and the Square is very beautifully surrounded by old classic houses in yellow. All streets around the Plaza Mayor is filled with shopping, and there are many local shops Selling clothes and handicrafts. 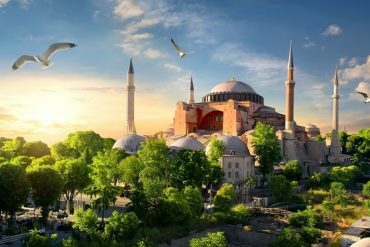 This is the cultural heart of the city besides the famous Cathedral. It is here the people gathers and it’s a great place to meet locals. It is open both during the day and night. During the evening, the atmosphere gets more festive and you will hear live Music. During the day it’s more relaxed and people are often Walking by or just sitting down at a cafe and people Watch or talk about the Daily things in Life. It’s definitely a place worth seeing and experience in Palma! 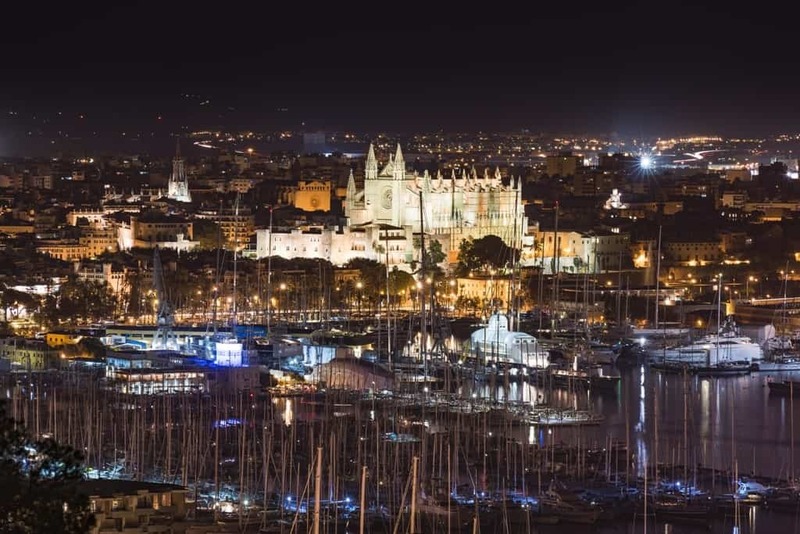 With everything from classy cocktail joints to international super clubs, Palma’s nightlife scene has all you need for an unforgettable night out. Starting the evening with a long, slow dinner and a bottle of wine (or two) among friends is a must, then continue on from bar to bar until you reach the late-night spots in Santa Catalina or El Terreno where you can dance into the early hours! Palma really does boast bars of every style with the classical elegance of Bar Abaco, the modern vibes of the Brooklyn Club and the local buzz of Molta Barra, you’re bound to find a bar that suits you. When you really want to ramp it up a notch, head over to the world-famous Pacha Mallorca to dance your heart out to top DJs. Don’t forget to dress to impress as this is the place to be seen in Palma! If flamenco dancing is more your style, The Galactic Club will give you a great chance to shake your tail feather with the locals who love to dance to live music every night of the week. 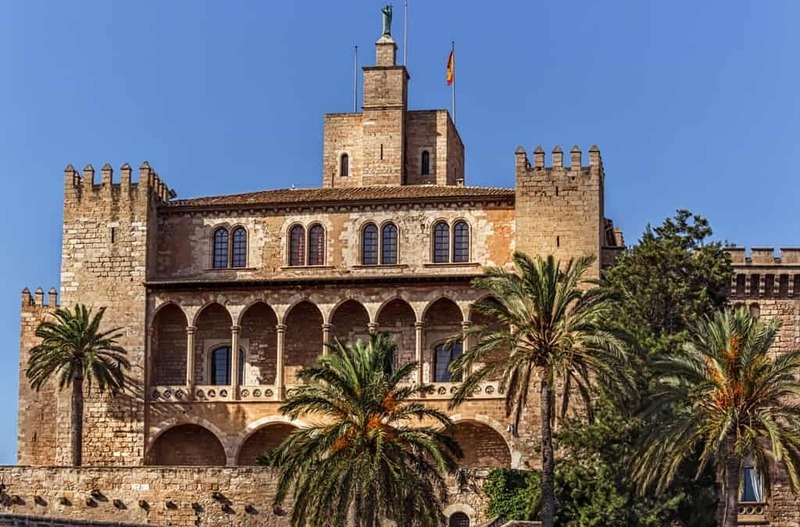 The impressive site of the Royal Palace of La Almudaina is one of the top attractions in Palma, Majorca, thanks to its interesting design and history. The palace was built in Moorish style in the 10th century as a Muslim fortress but was rebuilt over the years with a more Gothic style when the Christians regained control of the island in the 13th century. 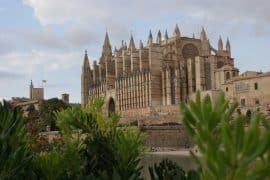 With its raised position overlooking the Bay of Palma, it’s not hard to see why the palace was used by every ruling power in the island’s history and why it is such a stunning site to visit to this day. The palace can be easily reached on foot from Palma (if it’s not too hot!) or there are buses and parking available. While the palace is the official residence of the King and Queen of Spain, it’s unlikely you’ll spot the royals but it’s always worth keeping an eye out! If you’re a foodie lover then eating at a Michelin-starred restaurant is probably high on your bucket list. Thankfully Palma, and Majorca on the whole, have you covered! With two one-Michelin-starred restaurants in Palma itself, and a handful scattered elsewhere around the island, Majorca is a real foodie heaven! Marc Fosh serves up quality local cuisine in a modern restaurant with both indoor and outdoor seating. Fosh, originally from Britain has lived and worked in Spain for over 20 years and certainly knows how to produce exquisite takes on local specialties and flavours. Booking is essential! Adrián Quetglas brings together the uncommon pairing of Russian and Spanish cuisine in a magical way to create stunning plates of food that will blow your palette away. Born in Argentina, Quetglas has been cooking since he was a teenager and subsequently trained under Marco Pierre White and the aforementioned Foch. Both restaurants will wow you with their dishes, décor and top-quality service and you’ll wish you could afford to come back time and time again! Despite being the biggest city on the island, Palma does have its fair share of beaches that are ready and waiting for you to come and relax. While most of the beaches surrounding the city are fairly built up, this doesn’t take away from the fact that they have soft golden sands and pristine azure waters – heavenly! 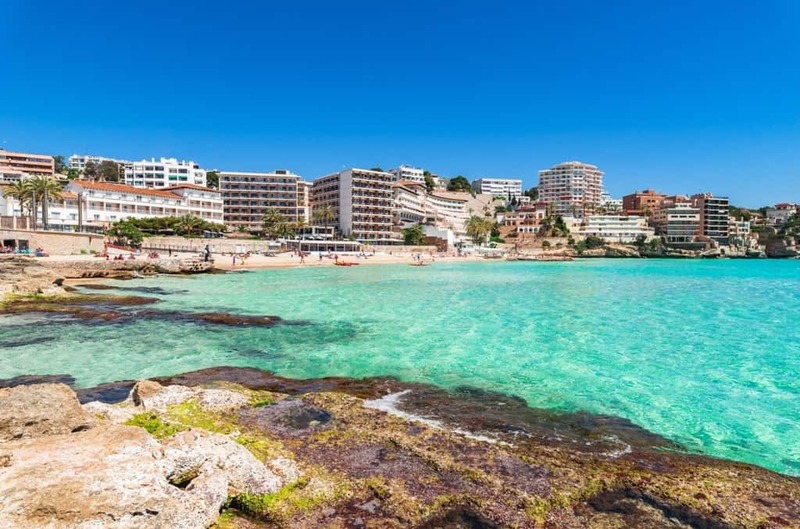 Cala Major Beach is a popular resort overlooking the Bay of Palma that is a family favourite and is great for those seeking a bit of down-time out of the city. The bay has a selection of decent bars and restaurants to keep you happily fed and watered as well as sunbeds and parasols for when the sun is at its strongest in the middle of the day. 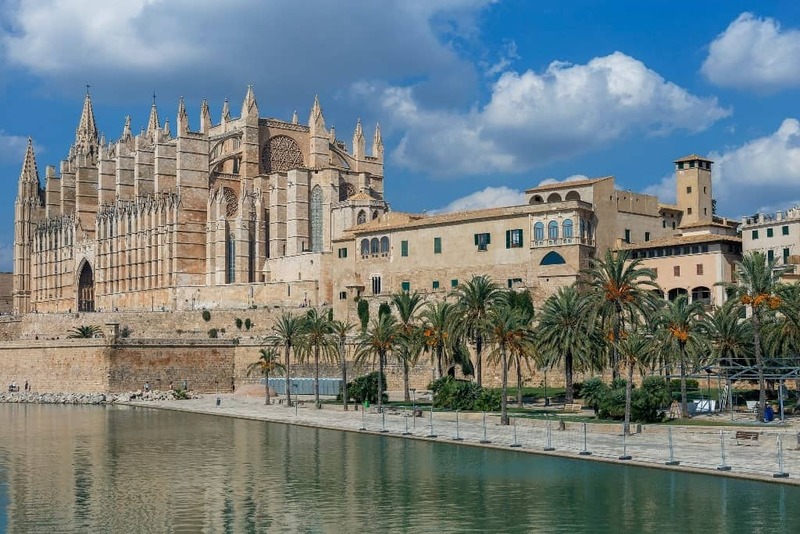 With a year-round tourism season, temperate climate and tons of top attractions, visiting Palma really is a no brainer. Plus, the city offers the best of both worlds, with cultural sights and beach relaxation in one. Stay in one of the city’s boutique hotels, fall in love with the food and create memories of a lifetime in this captivating capital. Spend your mornings meandering through markets and museums, your afternoons in cafés by the sea and your evenings checking out the city’s buzzing nightlife – it doesn’t get much better than that!